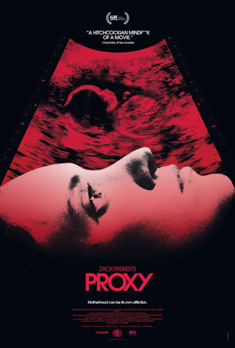 Proxy begins with Esther Woodhouse (Alexia Rasmussen), who is nine months pregnant, at an ultrasound appointment, talking to a technician (Shayla Hardy). Rasmussen’s stunningly removed vocal and facial affect tells us that Esther is, at the very least, depressed. Co-writer/director ZachParker’s decisions are just as unsettling. For instance, Esther’s pregnancy belly is shaped oddly; the sonogram never looks like a fully formed baby; the technician’s conversation is bizarre; and so forth. Everything about the opening scene tells us that something is wrong, foreshadowing the next development, when someone with skinny legs and a red sweatshirt brutally attacks Esther. The mother survives, but the baby does not, and so begins a series of off-putting conversations, culminating in Esther meeting Melanie Michaels (Alexa Havins) at a support group. The two women form a friendship, but their relationship is complicated by a variety of factors, including, but not limited to, Patrick (Joe Swanberg), Anika (Kristina Klebe), Peyton (Xavier Parker) and Melanie’s own mental instability. In the early going, Proxy is atmospherically mind-bending, featuring considerable tension that causes confusion without frustration. It helps that the two featured characters, and the actors who play them, are compelling. Esther and Melanie are disturbed but still interesting, especially Esther, whose mental illness we do not understand until it’s too late. Throughout, Parker’s artistic decisions—including a slow-motion sequence and an odd fantasy in the picture’s climax—build tension. Rasmussen’s entrancing performance helps just as much. In her hands, Esther might be a psychopath, a broken victim or something in between. Unfortunately, Proxy does not sustain such quality, largely because many of the twists make Melanie less believable, but mostly because Patrick and Anika are not as interesting as Esther and her new friend. Swanberg plays Patrick with, more or less, a single facial expression, one that makes a would-be complex character decidedly one-note. As such, whenever Proxy focuses on him, it suffers. Ditto that for Anika, though for different reasons.Klebe’s performance is fine, but the character she plays is poorly written, so poorly that Anika is archetypal, unexplained and unbelievable. Parker and Donner’s portrayal of women doesn’t help either. The three primary females are, to varying degrees, insane, and the minor characters are either insensitive or weak. Would I call Proxy sexist? Probably not, but, at the least, I can understand why some (including Slant magazine) have. And, whether or not the film is biased, such characterization means we never genuinely empathize with any of these characters. In turn, we never feel Proxy’s would be emotion (I am aware that Slant’s review makes this point, as well). For all of that, Proxy remains interesting enough to warrant a tepid recommendation, if only because, it does successfully buy our interest. We want to know what will happen next.